A Designer’s Manual, Bill Mollison; Tagari, 1991. 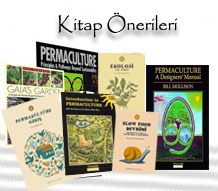 The Basics of Permaculture Design, R. Mars ve M. Ducker; Permanent Pub., 2005. Gaia’s Garden, Toby Hemenway; Chelsea Green, 2001.